If you don&apos;t know who Eiza González is, you will soon. The 26-year-old (who currently stars in the From Dusk Till Dawn: The Series) recently landed a role in James Cameron&apos;s highly anticipated action film, Alita: Battle Angel, due out in 2018. Next year, she will appear opposite Kevin Spacey and Jon Hamm in Baby Drive. But long before she hit it big in the US, Eiza was a popular actress and singer in her native Mexico—and looked a whole lot different to how she does now. In a 2011 interview, she openly admitted to getting a nose job. "There was no medical reason for the procedure," reports Us Weekly; "she said she just didn&apos;t like the way she looked." Did the cosmetic adjustments stop there? Well, according to Radar Online, the Mexican press has accused her of being "addicted to plastic surgery." Eiza González at Premios MTV Latinoamérica in 2008. Our first pic takes us back to 2008, when Eiza was 18 years old. There&apos;s the nose that she was talking about—and there&apos;s no doubt that it is wider here, especially through the bridge. She also has a fuller face (but didn&apos;t we all at that age?). Her natural dark brunette hair was lightened to this reddish brown. Eiza González at the 2009 Lo Nuestro a La Musica Latina Awards. The following year, Eiza added tons of highlights to become a blonde. I think she&apos;s one of those rare colour chameleons with the skin tone to pull off a wide range of shades. Despite the interesting choice of red carpet headgear, I think she looks super-adorable here. Her nose fits her face well, and with her cute smile and the peachy-pink makeup, she has a real "girl next door" appeal. That said, I&apos;d never would&apos;ve identified this as the same person! This photo was taken after Eiza had the rhinoplasty surgery done (at least the first time!). It&apos;s a little narrower, but still fairly conservative. She also looks different due to the new, drastically darker hair colour, and heavier makeup. Notice her teeth, because I believe she made enhancements there later on, as well. As for her face, she seems to have lost a bit of the baby fat. However, she may have been suffering from an eating disorder at this time, as she revealed on Instagram. Eiza Gonzalez at InStyle Mexico&apos;s 5th anniversary party in 2011. The first thing I notice in this photo is the crease beside Eiza&apos;s nostril. Well, she has two, but it is a deeper line on the one side. Nose job gone wrong, perhaps? It certainly wasn&apos;t there back in 2008. She also looks much more grown-up here, probably from weight loss, as well as the more sophisticated makeup and hairstyle. Her top lip appears suddenly fuller. Eiza González at the 2012 Premios Juventud Awards. I just did a double take—doesn&apos;t this look like Bella Thorne? Both her and Eiza have Latin heritage, so that&apos;s part of it. It&apos;s also the brassy blonde hair. (Eiza told Allure, "For five or six years, I was blonde, but it was never the right shade. And the process destroyed my hair—it would break all the time.") However, one other feature I&apos;m wondering about is Eiza&apos;s jawline. She does look quite a bit thinner here, but could that account for her jawline&apos;s newly pointy shape? Her eyes also look more open, but that may be from the heavy makeup. Eiza González at the 2013 Premios Juventud Awards. This was the year that Eiza moved to the US. You can already see how her look is becoming more and more refined. This is my favourite of her beauty moments (and where I think the cosmetic tinkering should&apos;ve stopped). She wears this blonde hair colour really well, and the red lipstick enhances her newly perfected smile. See how her teeth are now more uniform in size? Her whittled-down nose draws more attention to her eyes, and her jawline gives her face an oval shape. By 2014, Eiza ditched the blonde hair and warm tones for good, opting for this deep, solid brunette. She also started to lighten up her makeup. (She told Allure: "Being here, I do wear less makeup, and it&apos;s made me much more conscious of my skin. In Mexico, if you get a little zit, you can just pile makeup on. And the more irritated it becomes, the more you pile on.") If I was on the fence about her getting lip injections before, I&apos;m not now. Her top lip looks unnaturally full here. I also wonder if she might&apos;ve had cheek injections at the same time, as they definitely look more chiseled. Finally, check out her nose. Possibly, she had a second surgery there, because it is even narrower and more sculpted than before. Eiza González at the 2015 Latina Hot List party. In this shot, Eiza is giving me Jessica Alba vibes. That&apos;s from her new Ombré highlights and her long face shape (which also appears to be new, at least compared to eight years ago). One other development is that the creases by her nostrils are gone. Maybe that was corrected in her second nose job, or maybe she gets injections there to fill them in. Eiza González at the 2016 GQ Men of the Year party. That brings us to Eiza&apos;s most dissimilar look yet. Besides the almost-black hair colour, her upper cheeks have become ultra-sculpted. Likely, that&apos;s from fillers, as she never had such noticeable hollows underneath. Along with her sharper jawline, this gives her face a much more angular look. Eiza&apos;s sculpted cheeks are just as prominent in this 2017 shot, although it&apos;s a little softer because she lightened her hair colour again. (I really like this reddish tone, and prefer it to the deep brunette.) It looks like there&apos;s probably filler in her upper lip again. Eiza González at Marie Claire&apos;s 2018 Image Makers Awards. Something is definitely lifting Eiza&apos;s brows up here, and I don&apos;t think it&apos;s just the tight hairstyle! In other words, it&apos;s Botox, and at 28, she&apos;s a little young to be doing that (not that it ever looks natural to raise the tails, in my opinion). Even still, with the undone top knot and subtly graphic eyeshadow, she looks more polished and stylish than ever. Eiza González in 2008 (left) and in 2016 (right). Unlike so many celebs who deny, deny, deny, Eiza gets points for being open about her nose job. Obviously, she is someone who wanted to achieve greater levels of success in the US, and (like it or not) cosmetic surgery, especially rhinoplasty, kinda goes with that territory. Do I believe that&apos;s the only thing she had done? Well, people do grow into their looks, and weight loss can change the angles of a face. And you&apos;d be surprised at what doctors can do with injectables these days... so maybe she IS telling the truth. After all, injections aren&apos;t technically surgery. Here&apos;s what the pros think. "Her jawline seems less square and wide," Dr. Yael Halaas told Hollywood Life. "This can be achieved by using Botox in the muscle there." According to Dr. Brian Glatt, she also "appears to have had Botox treatments in her forehead and brow." Eiza is probably tinkering with fillers as well. 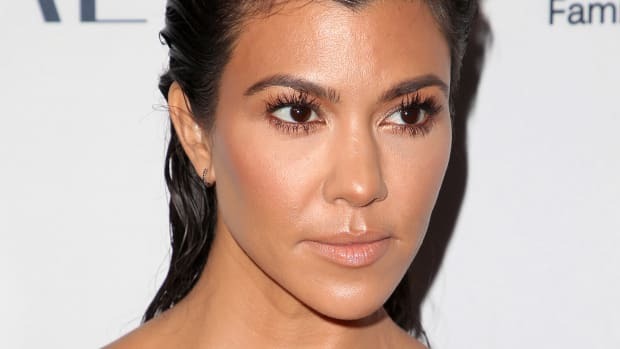 "It seems she may have had fillers injected into her cheeks as they are noticeably higher and more pronounced," says Dr. Marina Peredo. "Cheek augmentation also makes the whole face appear thinner and longer. Another area of question would be her lips. Her lips look a lot fuller now which could mean she may have gotten injections to plumpen them." However, there may have been more permanent interventions, too. "Her upper lids seem more visible which can be achieved by upper lid blepharoplasty," says Dr. Halaas. "She also may have have some work on her chin (perhaps even at the time of her rhinoplasty, which is a very common combination) as it appears smaller and better defined," adds Dr. Glatt. "She likely had a small chin implant placed." No wonder she has been dubbed the "the Michael Jackson of Mexico" on social media. If Eiza has indeed altered that many things about herself, it can be a slippery slope. She was lovely before, and looks beautiful now, but maybe it&apos;s time to stop! How do you feel about Eiza&apos;s beauty evolution?